Janet Rosenberg Jagan (October 20, 1920 – March 28, 2009) was the first female President of Guyana, serving from December 19, 1997, to August 11, 1999. She previously served as the first female Prime Minister of Guyana from March 17, 1997, to December 19, 1997. The wife of Cheddi Jagan, whom she succeeded as president, she was awarded Guyana's highest national award, the Order of Excellence, in 1993, and the UNESCO Mahatma Gandhi Gold Medal for Women's Rights in 1998. Jagan was born Janet Rosenberg to middle-class Jewish parents on the south side of Chicago, Illinois, on October 20, 1920. 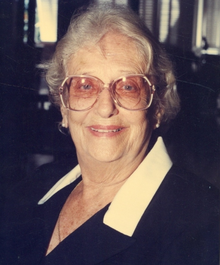 Her maternal grandparents, Adolph and Rosa Kronberg (née Appelbaum), were Jewish immigrants. Adolph immigrated to Chicago from Romania and Rosa came from Hungary. In December 1942, aged 22, while working as a student nurse at Cook County Hospital, she met Cheddi Jagan, an Indo-Guyanese dentistry student at Northwestern University. They married on August 5, 1943, and in December that year she moved with him to Guyana, where he set up his dental practice. In Guyana, she took part in labor activism along with her husband and joined the British Guianese Labor Union. She also worked in her husband's dental clinic as a nurse for 10 years. In 1946, she founded the Women's Political and Economic Organization and co-founded the Political Affairs Committee. Janet Jagan unsuccessfully ran for a seat from Central Georgetown in the 1947 general election. On January 1, 1950, she and her husband were co-founders of the left-wing People's Progressive Party (PPP); Janet served as the PPP's General Secretary from 1950 to 1970. Also in 1950, Jagan was elected to the Georgetown City Council. She was subsequently elected to the House of Assembly in the April 1953 election, winning a seat from Essequibo constituency. She was one of three women to win seats in that election; following the election, she was chosen as Deputy Speaker of the Legislature. The PPP, a Marxist–Leninist party, opposed British colonial rule of Guyana. After its electoral victory in April 1953, the PPP briefly formed the government, but the British government had the PPP government removed later in the year due to concerns about the Jagans' alleged Communist sympathies. Cheddi and Janet were jailed for five months; they were subsequently kept under house arrest for two years. In 1957, she was re-elected to the House of Assembly from Essequibo constituency and became Minister of Labour, Health and Housing. She later succeeded Claude Christian as Minister of Home Affairs upon Christian's death in 1963, but resigned from the Cabinet in 1964. As a member of the Elections Commission for the opposition in 1967, she expressed concern about the possibility of vote rigging. She was also the editor of the PPP newspaper Mirror from 1973 to 1997. Jagan was elected to Parliament in 1973 and was re-elected in 1980, 1985, and 1992, eventually becoming the longest-serving member of Parliament (46 years). Cheddi Jagan was elected as President of Guyana in 1992, and Janet Jagan became First Lady. She represented Guyana at the United Nations for three months in 1993, temporarily replacing Rudy Insanally when the latter was President of the United Nations General Assembly. After Cheddi Jagan's death, Janet Jagan was sworn in as Prime Minister as well as First Vice President on March 17, 1997. Jagan was the presidential candidate of the PPP in the December 1997 election. The PPP won the election, making Jagan the first female President of Guyana, as well as the country's first Jewish and first U.S.-born leader. She was also the third woman elected in her own right as chief executive of a country in the Western Hemisphere, after Eugenia Charles of Dominica and Violeta Chamorro of Nicaragua. She was named a Freedom hero by The My Hero Project. On July 1, 1999, after Jagan returned from the European-Latin American summit in Rio de Janeiro, she was admitted to St. Joseph's Mercy Hospital in the capital, Georgetown, due to chest pains and exhaustion. She was treated for a heart condition and released from the hospital on July 3. Later in the month, she underwent tests regarding her heart condition at the Akron City Hospital in Akron, Ohio; she was discharged on July 23. Returning to Guyana, she received heart medication and was told that bypass surgery was not necessary. Jagan announced on August 8, 1999, that she was resigning as President because her health meant that she was no longer capable of "vigorous, strong leadership"; she said that Finance Minister Bharrat Jagdeo would be her successor. Jagdeo was sworn in as President on August 11. Despite her resignation, Jagan remained active in the PPP. At the PPP's 29th Congress, Jagan had received the second highest number of votes (671) in the election to the party's Central Committee, held on August 2, 2008. She was then elected to the PPP Executive Committee, in addition to being elected as editor of the PPP paper Thunder, on August 12, 2008. Jagan later left Guyana for Maracaibo, Venezuela for treatment. She later went to Belem, Brazil for additional treatment. Janet Jagan died of an abdominal aneurysm on March 28, 2009, in Belem. Her body was cremated on March 31, 2009 in Brazil. Janet Jagan was long involved with the literary and cultural life of Guyana. She published early poems by Martin Carter in Thunder (which she edited) and supported the publication of early Carter collections such as The Hill of Fire Glows Red. She strongly believed that Guyanese children needed books which reflected their own realities. In 1993, Peepal Tree Press published her When Grandpa Cheddi was a Boy and Other Stories, followed by Patricia, the Baby Manatee (1995), Anastasia the Ant-Eater (1997) and The Dog Who Loved Flowers. ^ a b c d e f g h i j k l m Profile of Janet Jagan Archived 2008-03-25 at the Wayback Machine, jagan.org. ^ a b c d e Romero, Simon (March 30, 2009). "Janet Jagan, Chicago Native Who Led Guyana, Dies at 88". The New York Times. ^ a b c d e f Rohter, Larry. "A Guyana Favorite: U.S.-Born Grandmother", The New York Times, 14 December 1997. ^ "The Jewish Roots of Former President of Guyana Janet Rosenberg Jagan". Guyanaca.com. Retrieved 2007-07-18. ^ a b History of the PPP, PPP website. ^ a b "The General Election of 1953", Guyana.org. ^ "Janet Jagan Sworn In", The Washington Post, 18 March 1997, p. A14. ^ "Janet Jagan". The My Hero Project. December 9, 2009. Retrieved December 8, 2016. ^ "Thunder in Guyana - Learn More". Independent Lens, PBS. Retrieved December 8, 2016. ^ "Guyanese president discharged from hospital", Associated Press (nl.newsbank.com), July 4, 1999. ^ "Guyana's president leaves U.S. hospital", Associated Press (nl.newsbank.com), July 24, 1999. ^ "Guyana Leader Fit After Akron Care", The Plain Dealer (nl.newsbank.com), August 3, 1999. ^ "Guyanese president resigns for health reasons", Associated Press (nl.newsbank.com), August 9, 1999. ^ "Guyana's new president urges racial tolerance", Associated Press (nl.newsbank.com), August 12, 1999. ^ a b Press release on Central Committee election, August 3, 2008. ^ a b "Donald Ramotar re-elected General Secretary of PPP" Archived 2008-08-20 at the Wayback Machine, Guyana Times, 13 August 2008. ^ a b "PPP General Secretary, Executive Committee Elected", PPP press statement, August 12, 2008. ^ "US-born ex-Guyanese president dies at 88". Associated Press. March 28, 2009. Retrieved March 28, 2009. ^ Nelson, Valerie J. (March 29, 2009). "Janet Jagan dies at 88; Chicago nursing student became the first woman president of Guyana". Los Angeles Times. Retrieved March 29, 2009. This page was last edited on 21 October 2018, at 02:27 (UTC).